“Inclusive Capitalism”? The Bosses Really are Worried! “unchecked market fundamentalism can devour the social capital essential for the long term dynamism of capital itself”. This is now what the more nervous capitalists are worried about. They want a new Keynesianism and have turned those like Thomas Piketty, who have marvellously “discovered” that capitalism tends to create inequality, into best sellers. They are not alone. The unions and social democrats here have as ever called for more government spending. Even Tory Chancellor George Osborne realises that the decline in workers’ ability to exist is a bit of an economic problem (the social consequences are of no interest to him) so is planning (a very modest) increase in the minimum wage. They are all however united in trying to save the system. But all of them forget that Keynes’ monetary theories were based on government’s spending money to create jobs at a time when spending had been cut. Today, since the speculative bubble burst in 2007, every state has had to prop up the financial system to save capitalism. 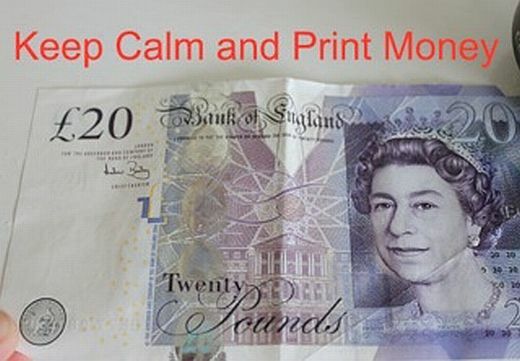 They have literally been printing money (but only for the banks) via so-called “quantitative easing”. This means they are already saddled with too much sovereign debt to be able to take the road of piling up more debt. The only alternative they have therefore is to attack the working class all the harder in an equally vain attempt to solve the crisis. And this is what worries our neo-Keynesian “inclusive capitalists”. They can see that the store of social strife is mounting up. In the EU and the US the working class’ share of income has fallen from 64% to 58% since 2009. This comes on top of a slow decline in real wages in the traditional capitalist countries since the current crisis of accumulation began in the 1970s. With the extra attacks on benefit cuts, cuts in the health service and the never ending saga of increasing the retirement age the surprise is not that some sections of the ruling class are worried. The real surprise is that the fightback is so muted. There are many reasons for the lack of a fightback so far. In the first place there is never a mechanical reflex against worsening conditions. In real life people try to adjust and make do. They hope that austerity will soon end. Until they can no longer see a way out … Second the attacks have not been against us all at the same time and in the same way. There is just now no poll tax issue to unite everyone. The victims of the bedroom tax, for example, largely see their problems as their own. And third we have been in retreat as a class for so long that we have lost much of the class cohesion that we had in the past. And they cannot. That is the nature of the system. And now we can see a class in the slow process of recomposition around the world. Precariousness of occupation and ever lower wages, the incapacity of the system to integrate millions of young people, the growing antagonism of those in public sector jobs and continuing austerity have led to riots, strikes and protests around the world. As yet these are localised (many are not even reported) but many are signs of hope for the future. The “red squares” student movement in Quebec in 2012, the “plenum” movement in Bosnia earlier this year which rejected all the attempts to drive nationalist wedges between the protestors, the almost 6 month platinum miners strike in South Africa (now replaced by a strike of 200,000 metalworkers) and the long running series of strikes in China, Vietnam, Cambodia and Bangla Desh all demonstrate that the world working class is alive and fighting. What it yet lacks is coordination and cohesion. What it yet lacks is a programme and an international political organisation. However the rising level of class antagonism is creating new possibilities for the growth of revolutionary organisation. The CWO, as the British affiliate of the Internationalist Communist Tendency aims to be part of that new movement and contribute to the formation of an international revolutionary political organisation based in the working class and of the working class. We appeal to all who share our vision of a better society to contact us, support us and join us. We will then really make the capitalists of the world, “inclusive” or otherwise, “tremble” at the prospect of proletarian revolution. I also loved your idea of "RECOMPOSITION" and the suggestion that it is taking effect now in places round the globe. The recomposition of the class may counteract the decomposition of society as seen by the ICC. I hope so anyway. As to the crackpot notion of "the inclusivity of capital" surely this is a bourgeois joke? We may be starving, out of work, lacking medical attention and the kids go to a lousy school, yet we're supposed to believe that capital loves and includes us all in its icy embrace...you gotta be joking. Anyway, who'd want to be embraced by the deadly poisonous tentacles of an "inclusive, capitalism? Better be embraced by a grizzly bear. At least the grizzly is warm blooded and alive! Capitalism means death.